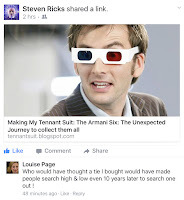 I am often contacted by readers who either want advise on tracking down more screen accurate costumes, or want to show off their latest purchases that are worth sharing with my wider readership. Over the past couple of months I have been chatting to a client of mine who has been an avid (no obsessive!) 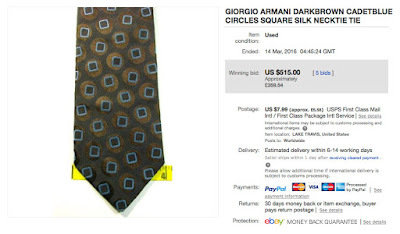 seeker of a screen accurate Giorgio Armani tie. His quest had recently come to fruition - something to give all with a similar goal good reason to keep pursuing their dream. 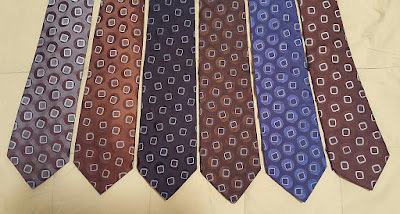 It cam out in conversation that he now had amassed SIX different versions of the tie, so I invited him to put his collection in writing and below is a breakdown of his impressive collection. 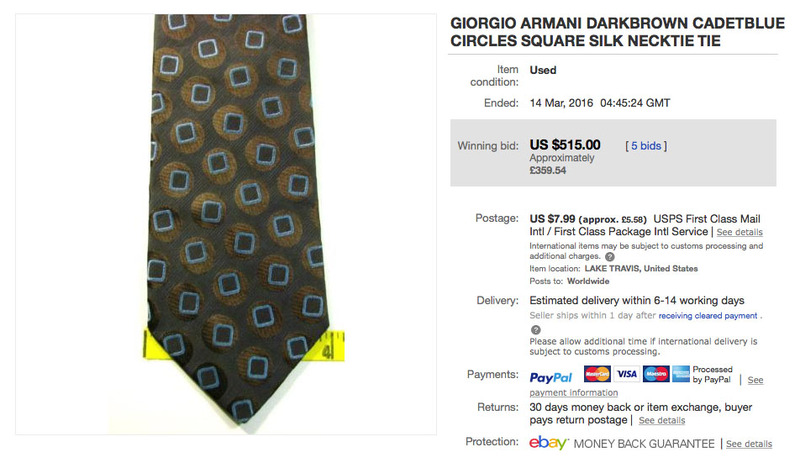 First in the group of originals is the black colourway variant of the Armani tie. To admit, when I first laid eyes on the auction and purchased it late last year, I thought I had found the brown version. When the package arrived, I was disappointed to see it was the black variant. The mistake is due to the colour the tie can take on when photographed. The seller had only taken a few close pictures. In some shots it takes on an almost brown quality! Still beautiful, and would look sharp with many dress styles. My next original would come in the form of the blue variant, which also hit eBay late last year. After some debate on whether to bid or not, I figured what the heck. I won, and I opened it on Christmas. My third original, which I have searched day and night for, over the last two years - my personal Holy Grail of Doctor Who: The brown Armani tie! After watching a new episode of The Walking Dead, it was time to do my usual eBay searches. This time, I would hit gold. 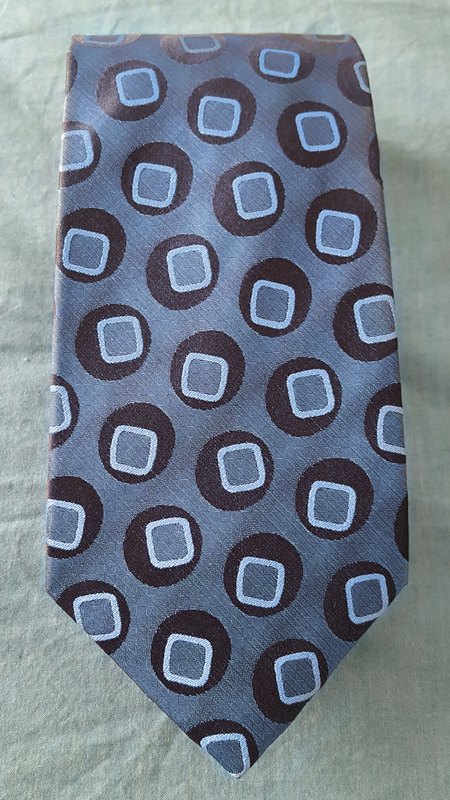 After a week of nail biting, and going back-and-forth with the seller to find out what she planned to do with the tie (yes, many were offering sums of money), the Sunday night finally came. With seconds to spare, I placed my bid and felt my heart jump for joy when I saw the note saying I was the winner.. My wallet hated me. Apparently I wasn't the only one willing to give my all. 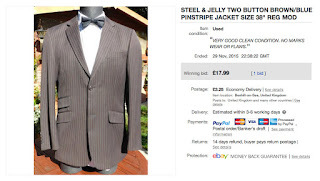 This auction was featured on my blog in March 2016. A reader had alerted me to it after he had missed out (one of those willing to give their all). 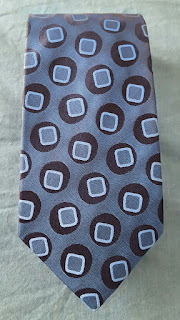 I was later contacted by John Tennant Smith who said he was the buyer of the tie! The result of our discussions is the article you are reading. 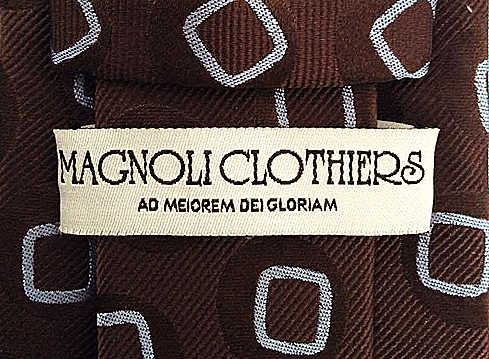 Onto the reproductions: over the years, Indy from Magnoli Clothiers has produced this tie in three different versions (with a fourth red version on the way). 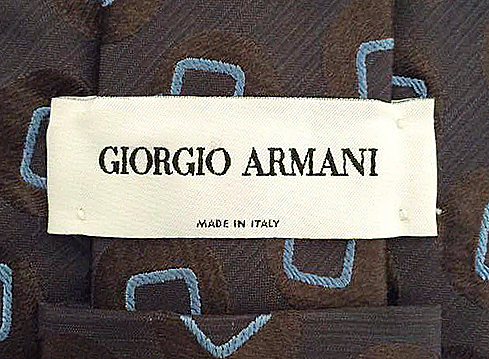 My first version of the Armani is the first one he produced. 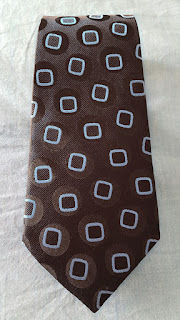 I bought this tie a couple years ago when he had made the switch to his current Armani. I was new at cosplay and collecting, saw this on eBay for about half the price of his new version, and figured it was good enough. 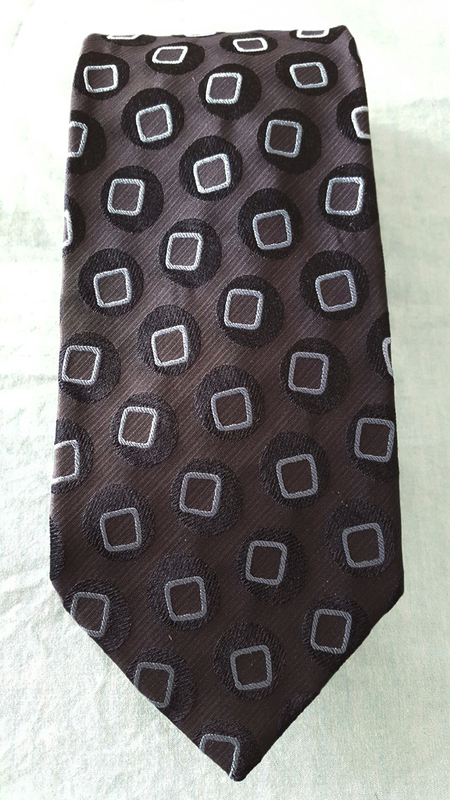 As I wore it with both my Baron brown suit and Magnoli brown suit, I became unhappy with how bright the tie was compared to the original.. 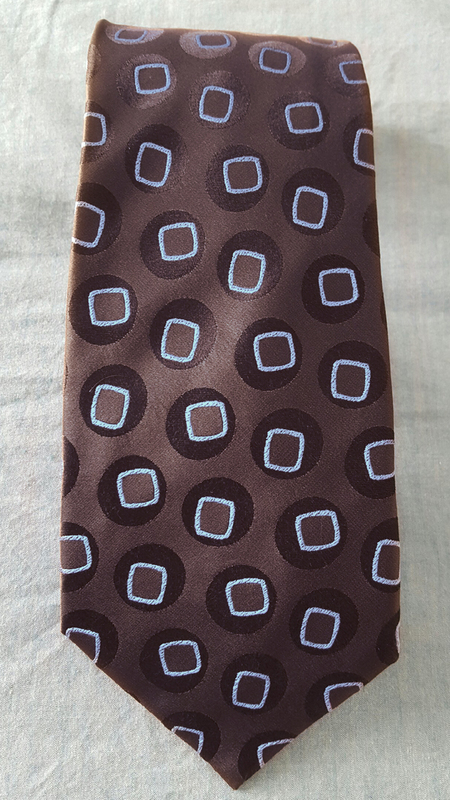 Cue the second Magnoli tie produced: his alternative colourway. 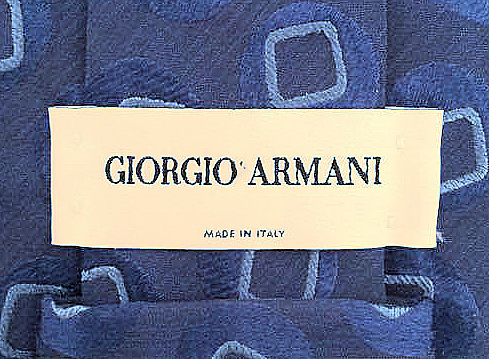 At the mistake of his factory, the colours messed up, taking on the look of the Armani when shot at an angle, appearing dusty blue. 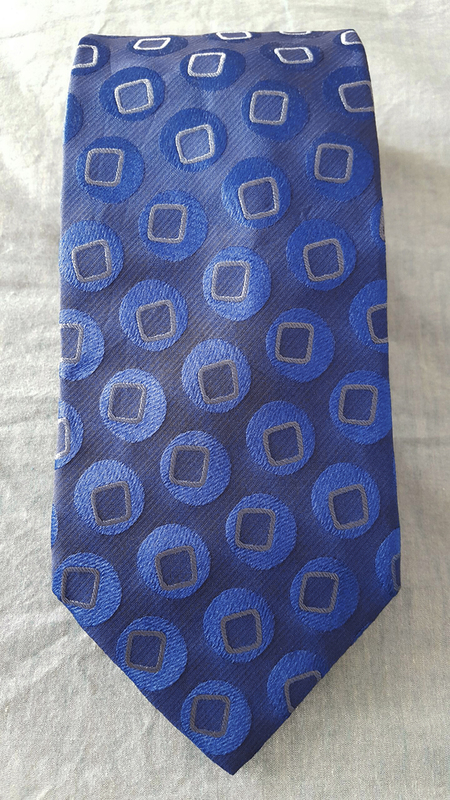 I figured it’d look cool to wear, so I picked it up. It’s a nice tie for the Doomsday look. 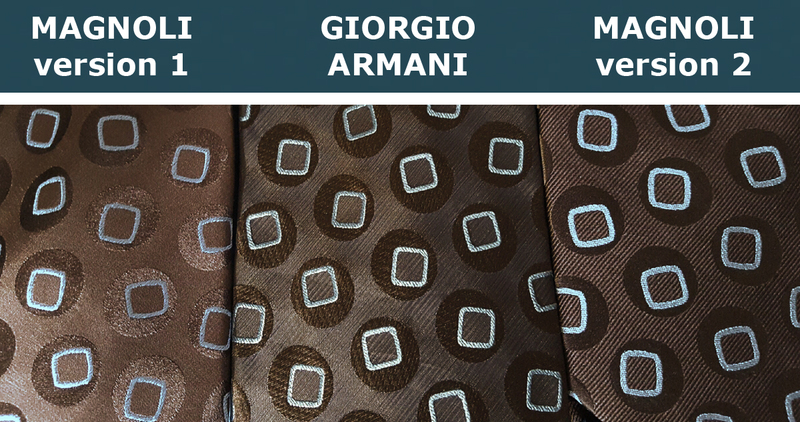 Things come in threes: Magnoli Clothier’s third, current iteration of the Armani tie. 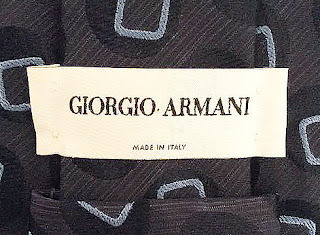 I love the Armani, and having become unhappy wearing my two reproductions that I own... I bit the bullet, and bought his new version some months after he released it. Upon opening it, I loved it! It really is a great alternative to the original. 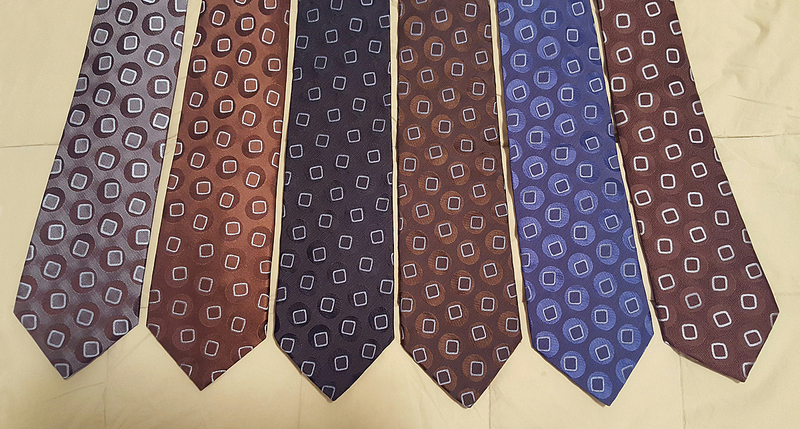 While buying the repro ties, I never gave up looking for an original, knowing that was my end goal. It took a great while, but I did it. Thoughts of what to do with the others have crossed my mind. 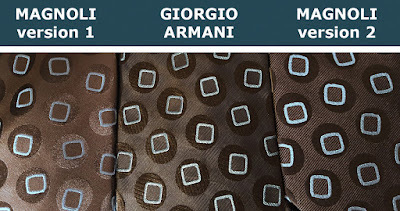 Maybe one day the collection will split, but for now I like the family of Armani's, as it tells my story. How do the reproductions stack to the original? In my opinion, each iteration has its qualities to the original, that the other ones lack. 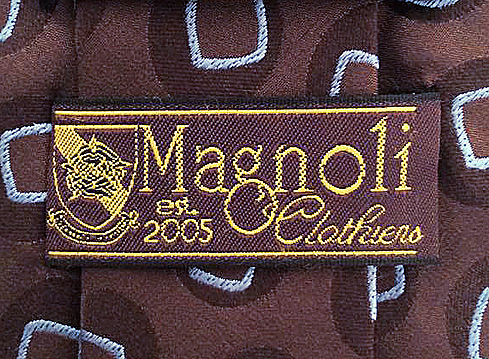 The first tie Magnoli produced had captured the embroidery of the blue boxes almost perfectly, that his future iterations went away from. Magnoli's second tie (blue colourway) used a more accurate silk base that his 1st and 3rd lack. Magnoli's current iteration lined up the egg pattern perfectly. If all three of those qualities mixed, and a base colour tweak, I bet the results would be stunning. To close out, I'm proud of this accomplishment. The Armani is over 10 years old! Many may have been produced, but with how many have likely ended up in attics to rot, dumps, shipped to far away lands, or are just sitting in some hole in the wall thrift shoppe... very few have ever surfaced on eBay; who knows when the next one will pop up. However, if you want something, and can stay determined and wait it out, then there is always the chance to accomplish your personal goal. 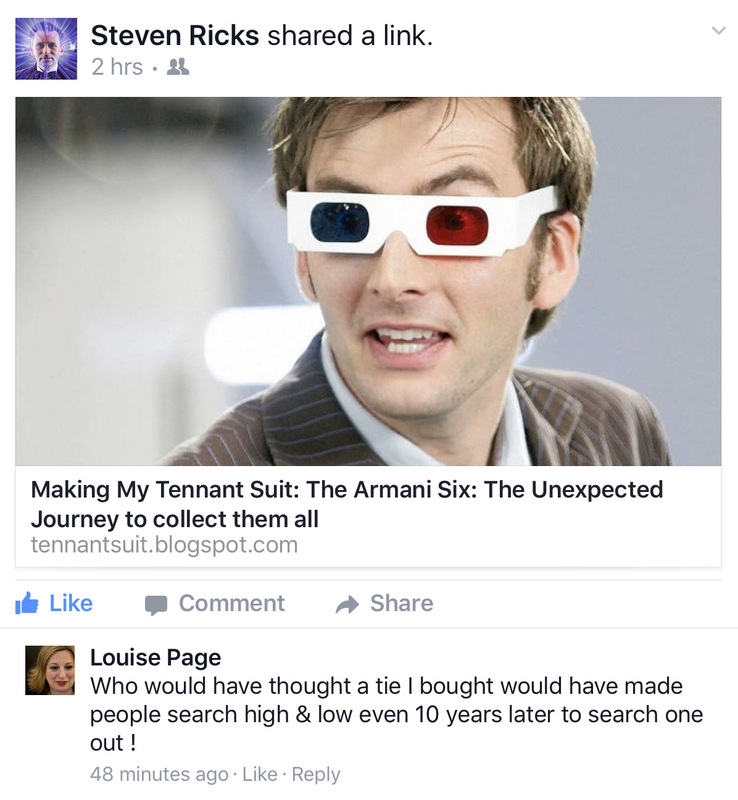 Recognition has come for John’s quest, in the form of a comment posted by none other than Louise Page herself. Who would have thought a tie I bought would have made people search high & low even 10 years later to search one out! 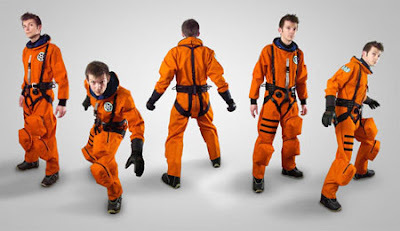 Following on from my reader’s enquiry about the SpaceToy space suits, I thought it a good time to reproduce an article which first appeared on the DW_Cosplay forum way back in March 2011. 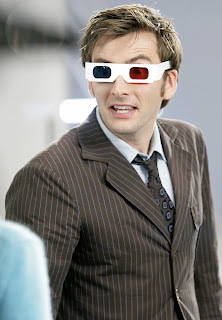 At the time Tennant-era costume designer Louise Page had just been a gust at that years Gallifrey One convention, and all things Tenth Doctor were all the rage! 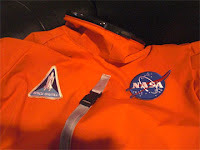 After hosting a panel with the always awesome Bob Mitsch where the mantra of sharing what you know to benefit the community was a prevalent encouragement, I thought I’d share the successes and hopefully prepare you all for some of the pitfalls in what it took to put together my SB6 space suit for Gallifrey One 2010. As well as some really neat details I was told about the real suits by costume designer Louise Page at the convention just last week! For those who don’t know me, I’ve already dressed as Ten at several Who cons using an old Magnoli suit. 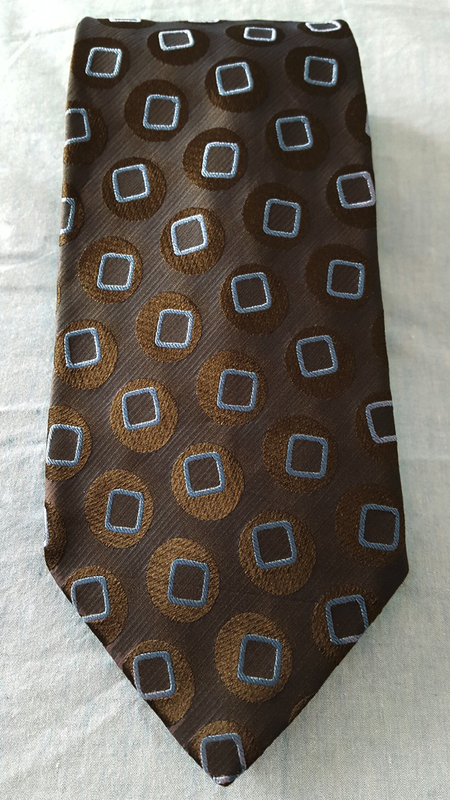 It looks fine and I’ve nothing against the brown suit but after wearing it so many times I was desperate for a little variety. 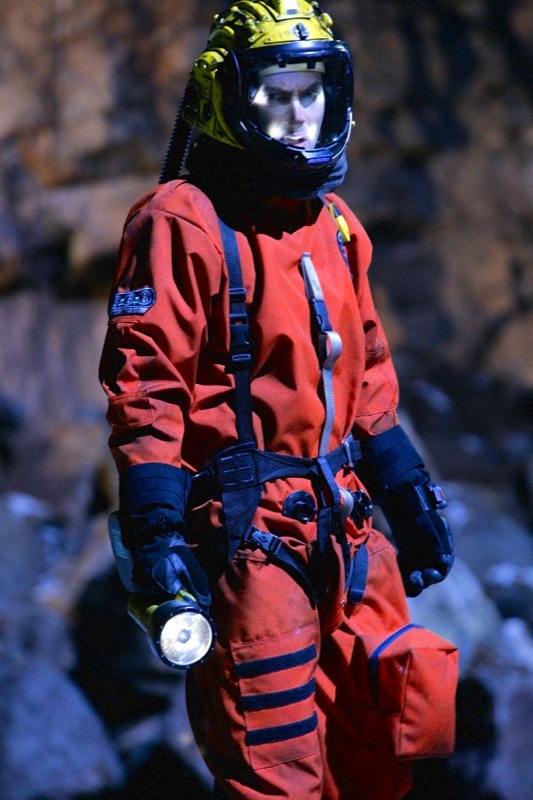 I’m nowhere near getting a quality blue suit yet, his Christmas Invasion pajamas look fun and certainly would be comfortable, but clearly nothing stands out quite as cool as the space suit from the Satan Pit episodes. Plus with it’s reappearance in The Waters of Mars cementing it as a repeat costume, I know it’s popularity has shot up. Decision made! Either way it was still exciting to find (what I thought) was a totally screen-accurate source for what makes up 90% of the costume. So I even though it had a mighty hefty price tag at $545 with an additional shipping charge of $99 (yes, you read that inflated shipping cost right) I figured I’m an adult with an adult job and can afford something like this one more time- after all, if I can recover from buying a PS3 I can handle this right? Large – Height: 5'5" - 5'10" and X-Large: 5'10" - 6'3" with custom sizing at request (possibly at an extra charge-I don’t know for sure though- I never asked). After two weeks I finally got it in the mail and with fevered excitement tried it on for the first time… Yikes. If what I was wearing was considered the smaller of two “Larges” I can’t fathom what form of mighty giant the “X-Large” would have draped over snugly- I don’t even think Shaq would look moderately fitted in one. Now it fit me all right in the shoulder and leg length but for whatever reason, SpaceToys seemed to have anticipated me possessing some ungodly huge gut. Of course I know it’s supposed to look baggy and baggy it did look. But to such an extreme that I had almost 8 whole inches of material sagging off the crotch end of this thing like left over stomach skin after liposuction. The crotch sag made this Doctor look more like “Gangsta Who” and I expected be hearing someone sing “Pants On The Ground” to me at any second. Imaginative comparisons for the sizing aside, there were several other major details which were totally off and some even missing completely! For starters the pouches on the legs had NO ZIPPERS. This one really got me steamed especially since the picture on the darn website clearly shows the suit with zippers on the pockets. 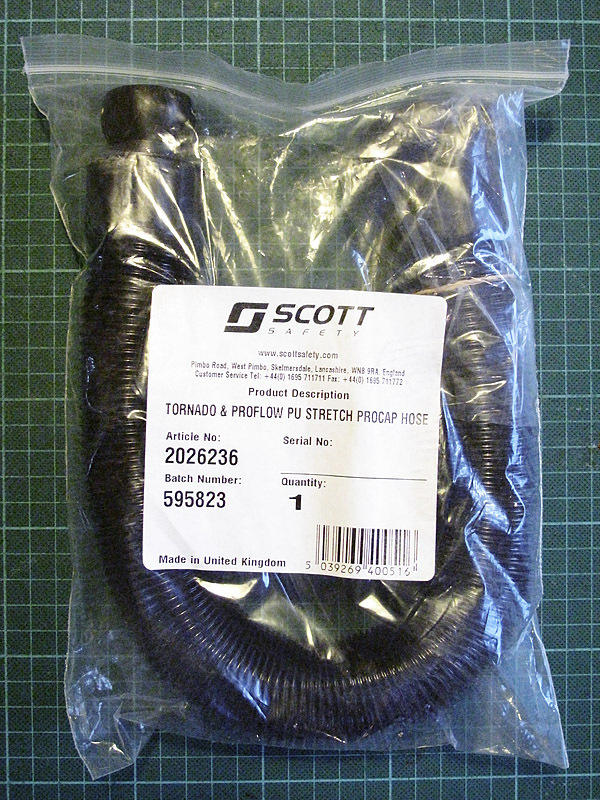 On top of that (and I nearly missed this one because I was mostly looking at it on myself in the mirror) the three black Velcro strips across the right leg had jumped ship at the SpaceToys production house and landed incorrectly sewn onto the left. Again, a detail contradicting the photo they used to advertise their expensive product. 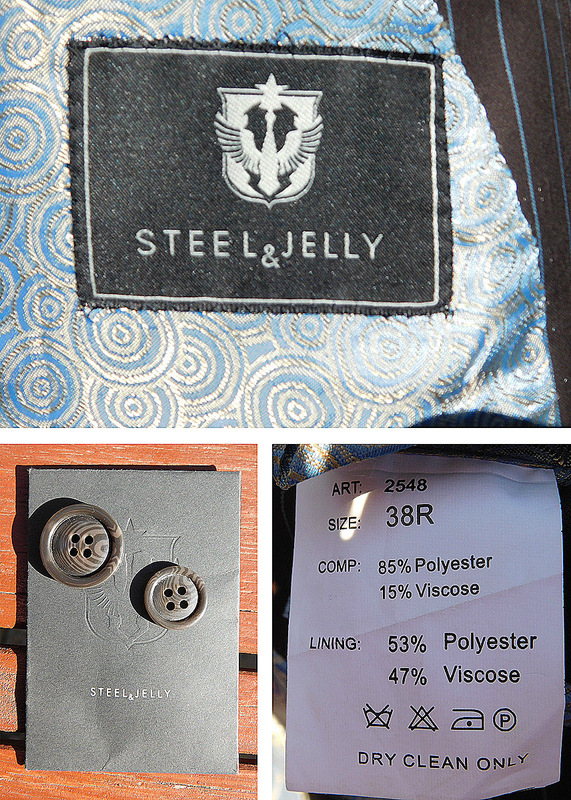 …Were cheaply HOT GLUED DIRECTLY to the fabric!!! We're talkin' globs of it fused into the fibers. Even heating it off with a heat gun would leave tons of slick residue. I could hear my $644 laughing at me from Hell. I called up SpaceToys and calmly inquired into a possible exchange. I was just as calmly reminded that the website contains disclaimers informing me that all sales are final and materials available for finishing the suits are dependent on their current availability. In short, I was screwed and that money was not coming back. Lesson learned and I hope it can serve as a warning to anyone looking to deal with SpaceToys over this product to make sure they’ll be getting exactly what they want before dishing out the cash. Well since this story is already running way too long, I’ll cut things short a give a quick run down what I had to do get the suit up to spec since I was stuck with it either way. • To solve the baggy waist problem I had to take the whole bottom of the suit apart which included the two front sections of the legs- This worked out okay since I was going to have to remove the pockets to add zippers to them anyway and it’s plain easier to sew them back onto the disassembled leg sections. 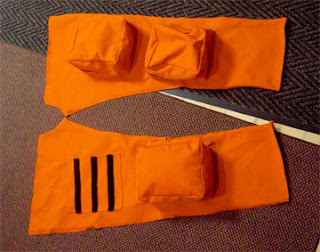 • I then cut about 6” of fabric off of the lower half of the body section where it seemed to be a better fit for me and then re-attached the front of the legs. • This brought the front leg pieces up higher than the back ones and they had to be trimmed to match. After which the entire legs ends were cuffed as they were before I pulled them apart. No this one doesn’t fold down & let you go to bathroom, it’s just a decorative fake… Sadly. 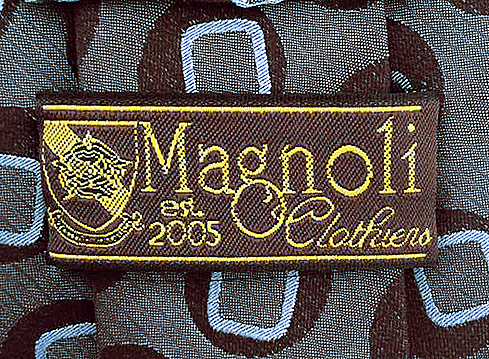 It needed to be sewn back on higher than were it once was on the front and shortened on it’s back end so it didn’t sag too far down past the crotch. • I removed all the pouches then cut and added 14” long zippers to the tops of them. I also switched the Velcro panel to it’s correct side. 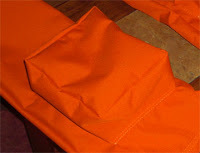 As you can see in the pic above, the material is a thick “Canvas Ducting Cloth” in “Hunter Orange.” I’ve found bales of exact matches in my local JoAnn’s and I’m willing to bet that’s where SpaceToys gets their supply too. The thread is a very thick, very visible line (almost like tying string) that leaves big holes in the fabric after it’s been removed. So be careful where you put your stitches or it will show should you change your mind. I found that if one small bit of the thread was broken, it would all quickly come undone. 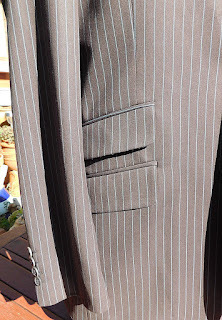 I could literally pull the suit apart if I wanted to once that small section of the thread was snapped. –Keep that in mind for something that Louise told me later. As such, I chose to use a smaller thread with a tighter spacing on my machine when I sewed it back together to make it stronger since I didn’t want to be forced to sew this thing back together a second time should I bust a thread. To my surprise it worked brilliantly! I then added some custom patches I designed in Photoshop from screen caps and had a friend with a proper machine embroider for me. 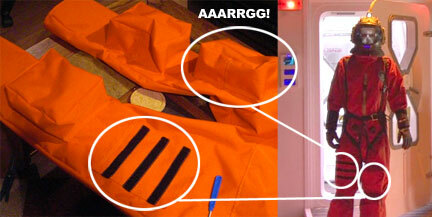 Thankfully, that was about it in terms of correcting the suit's problems from their maker. There’s a lot more to cover about all the other things that were created & added to make it as accurate as possible (i.e. 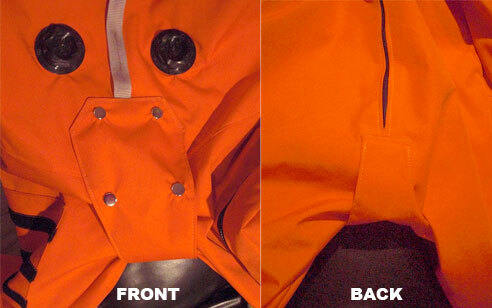 adding cuffed sleeves, a zipper cover, etc.) as well a whole list of the other items that make up the costume besides the suit. 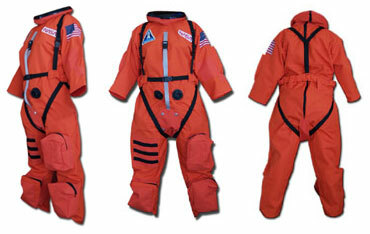 But I thought for now I’d just share what you may be in for if you decide to take the plunge and buy a SpaceToys suit. Louise: That looks great! Did you make it all yourself? 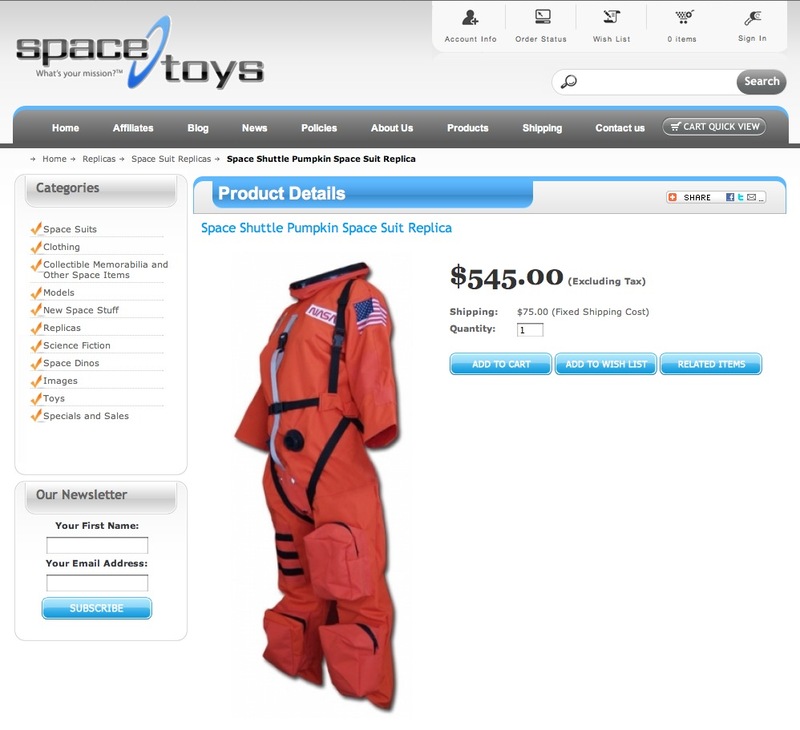 Louise (cutting me off): Spacetoys.com? Me: Yep that's the one. Louise: Oh what a NIGHTMARE! It turns out the suits she bought from them were just as cheap (in quality, not price) and came apart the first day they sized them just like I found to be the problem with the thread being easily pulled apart. Her experience with their customer service was just as deeply unsatisfying too. In the end she told me that to get a filmable suit they had to take apart the Spacetoys suits, use them as patterns and remake their own from the same type of fabric. Almost exactly what I had to do! She confirmed the use of the clunky snowboard boots seen in the London exhibits. The neck ring was remade by Millennium FX since the ST ones broke on the first day. The rubber billows that connect the yellow helmet to the suit’s neck ring was also custom sculpted & cast by them and was a pain to get it to work and hold together. 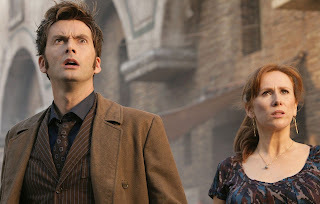 The second suit that the actress wears in “Satan Pit” was made very quickly as the part was recast at the last minute and the new actress was much shorter than the first. In fact the new one was the same height as Louise so she used herself as the model to base the new suit off of which is why there’s a picture of her out there somewhere of her wearing it in the costume shop. That’s all I can remember for now. Hope that’s helpful to anyone looking to make this costume. 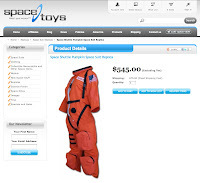 One of my readers contacted this week to ask questions and advise about the SB6 Space Suit, which came from US-based seller, Space Toys. 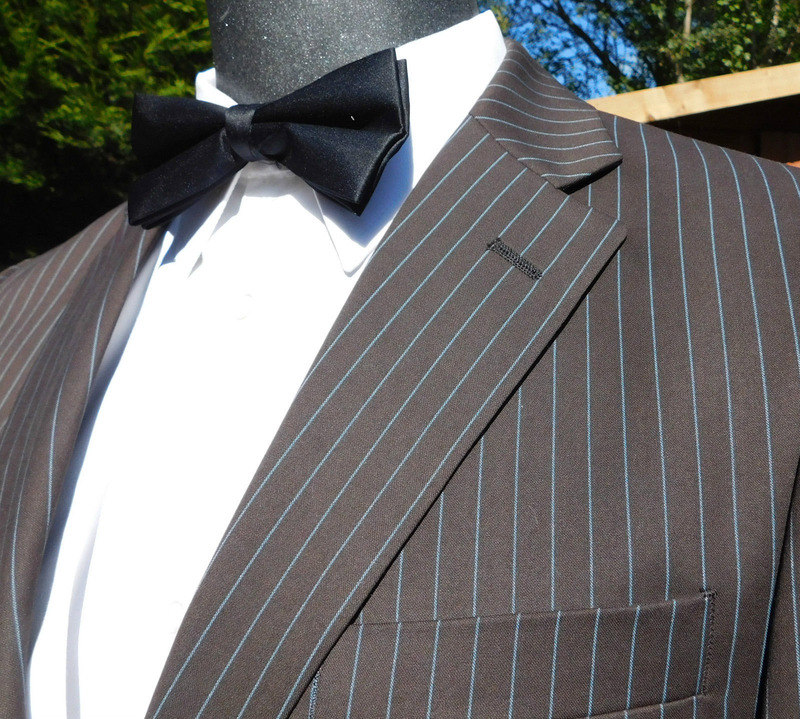 Personally I have never made myself such a suit, but I gave him the best advise I could - which is essentially not to buy it unless you are prepared for disappointment! This was backed up by my friend Kevin Coppa, who also bought one of the suits, only to be disappointed. The suits aren’t made that well, something the Doctor Who costume department found out when their’s arrived from the States. In fact the first outing for the suits (in The Impossible Planet) were actually remade from scratch by Louise Page and her team at very short notice. This was party because they weren’t what they expected, but also due to one of the lead actors was recast only a few days before filming started, and the replacement actress was much shorter than the original choice! 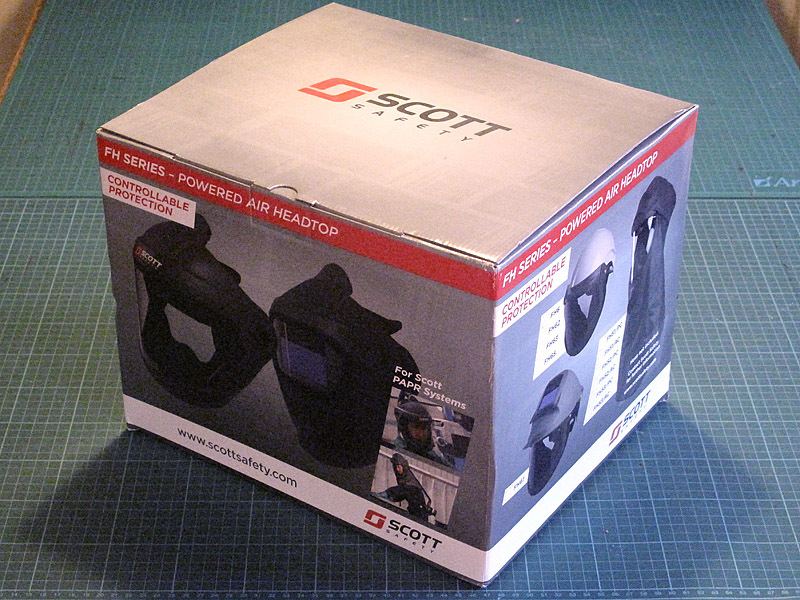 Anyway, my reader was also seeking one of the Scott Tornado T/Procap Headtop welding masks. This was used by the prop department as a base on which the SB6 helmets were built, and amazingly they are still available today. He had found a company in the UK that sells them, but they do not ship to the US where he is based, so I agreed to act as a middleman and send it on using my FedEx account. While I had it, I thought I’d take a few photos to share with the rest of my readers, in case anyone else is inspired to have a go at recreating one of these helmets themselves. 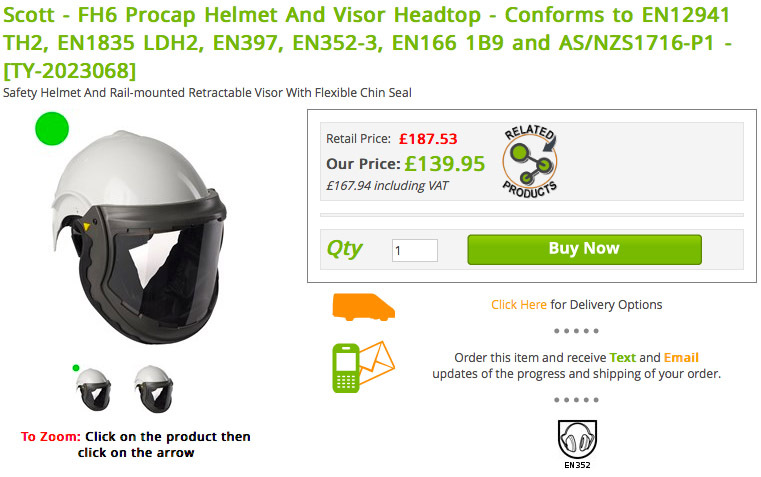 The helmet is the white moulded plastic part, and the grey visor hinges up over the head, but this is very stiff. 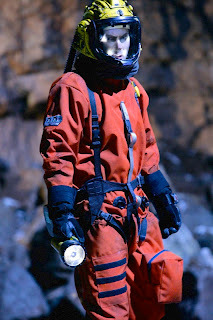 From what I can see, the visor and surrounding frame was little altered for use on Doctor Who, but the main helmet had to be enclosed round the neck before various moulded plastic attachments were added to make it look suitably spacey. Inside, there is a chin strap to help keep the helmet in place when in use, as well as a fabric curtain at the rear, presumably to keep hair out of harms way. 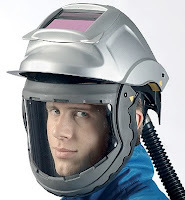 At the back of the helmet, there is a connector where a hose can be attached. This then plugs into an extractor unit which pulls clean air over the face of the user. 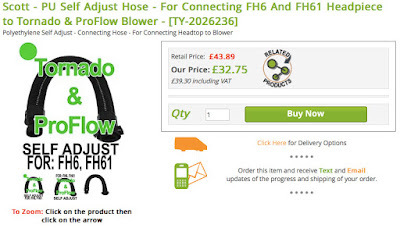 The prop department kept this part of the design intact, and the appropriate hose connector is also available from the retailer. 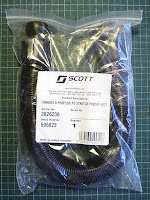 Here is the hose in its packaging. I’ll be keen to find out how my reader gets on with creating his helmet, and hopefully when he’s done I’ll be able to share some pictures of his finished masterpiece! 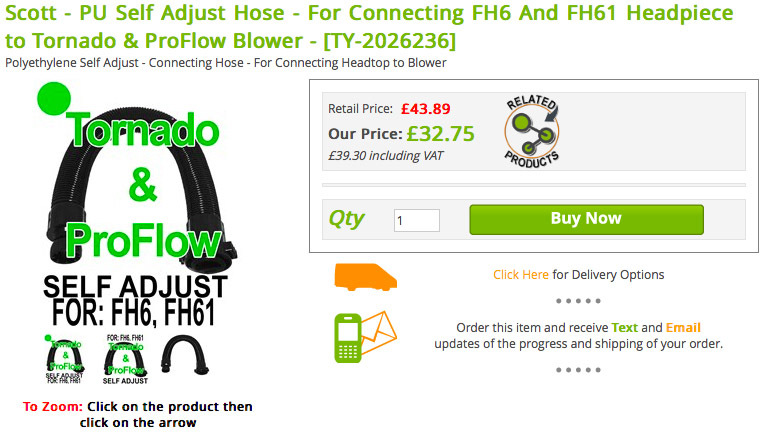 If you want to order your own welding mask and hose to then adapt into a SB6 helmet, here is where we ordered it from. 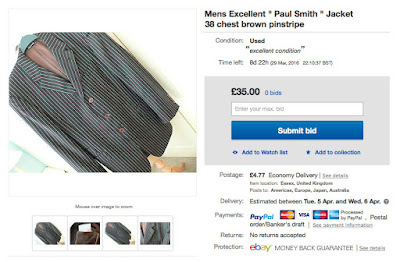 Philip, one of my readers, recently sent me a link to a curious item being sold on eBay. At first glance it is a rather unremarkable brown suit jacket, but once you start looking closer it becomes a bit more interesting. 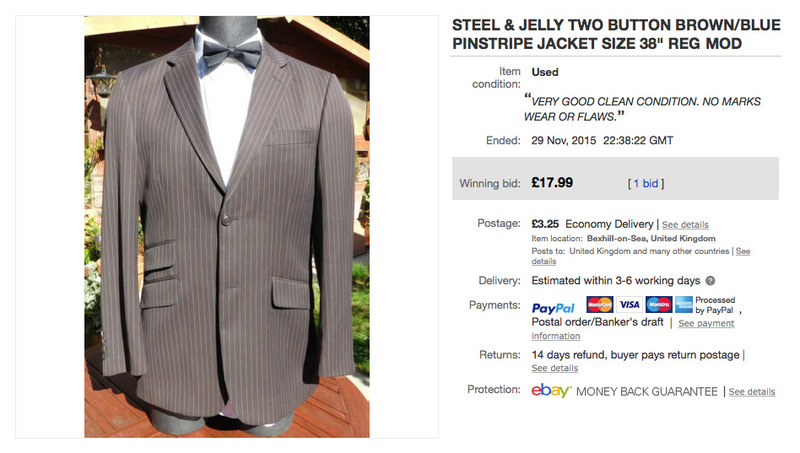 Ironically this is just the jacket, unlike the source of the original fabric for the suit, which was just the trousers! 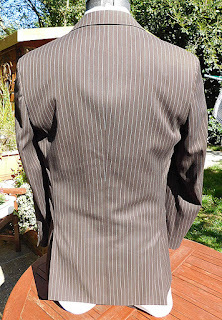 This well tailored two button jacket is a soft feel polyester blend fabric in Brown with a fine Electric Blue pinstripe design. 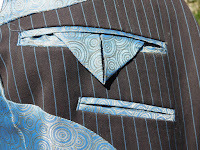 The jacket has a stunning blue Bull's Eye pattern satin like polyester and viscose lining. Two side pockets with flaps plus ticket pocket, one outer breast pocket, two inner breast pockets and a ticket pocket. 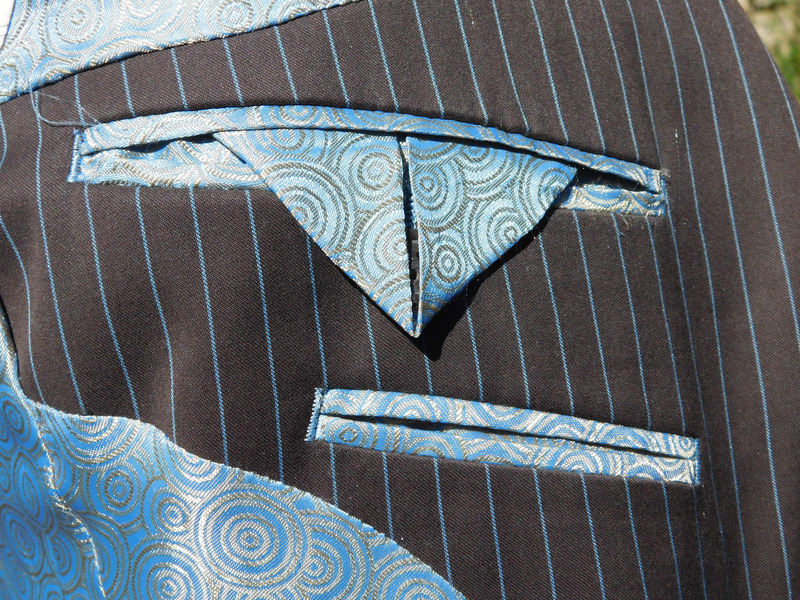 Two 8" vents, 3" lapels and four button detail on cuffs. Two spare buttons. External measurements: Armpit to armpit 21". 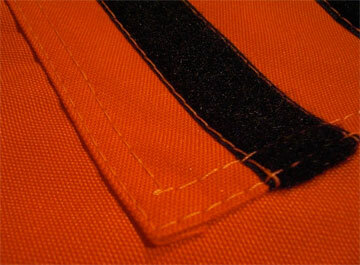 Shoulder seam to shoulder seam 18.5". Length; base of collar to rear hem 30.5". Sleeve; shoulder seam to cuff 25.5"